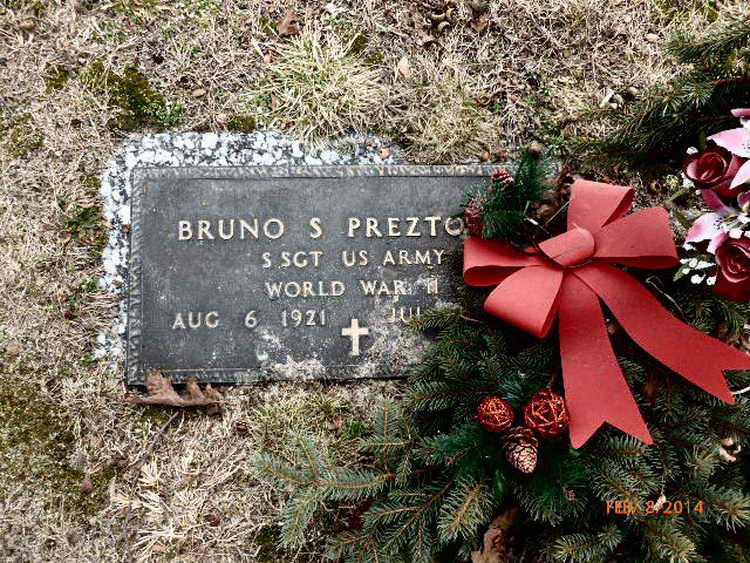 Grave marker for Bruno S. Preztos in the Ocean County Memorial Park, Toms River (Ocean county), New Jersey. Bruno enlisted in the Army at Philadelphia, PA on 12 August 1942 and was assigned to Company A, 508th PIR. Pfc Preztos was wounded on 16 June 1944 in Normand. He returned to the unit and was promoted to Sgt on 1 August 1944. Sgt Preztos was wounded a second time on 29 December 1944 in Belgium and did not return until 15 April 1945. His military awards include the Purple Heart with 1 Oak Leaf Cluster and the Bronze Service Arrowhead device awarded for participation in Normandy assault. 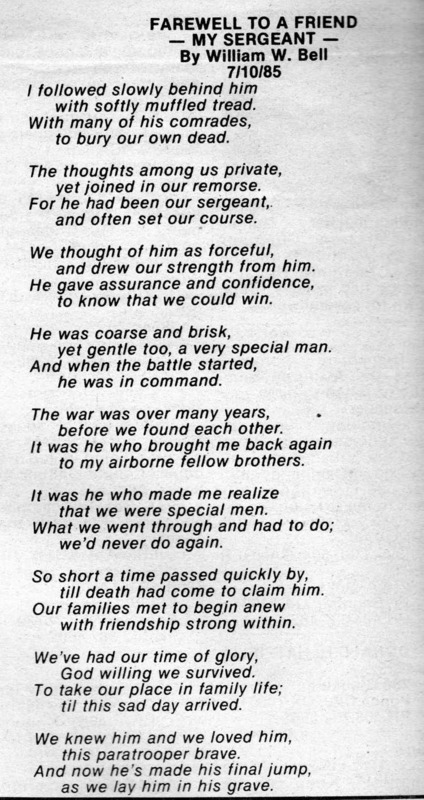 It is with deep sadness that I report on the funeral services of a mutual friend, and in my case a beloved comrade; Sergeant Bruno Preztos of Co. A, 508 PIR Association. With his passing I feel a very close and personal loss, as I know do many others who shared foxhole and road march with this remarkable man. Bruno died of cancer on July 4th, after a prolonged fight which spanned several years of painful internal disorders. He would hardly acknowledge either to others or even himself the seriousness of his illness. To him tribulation and hard times were only temporary obstacles of concern to no one but himself, he would always find his own way out. Rosemary and Bob Malcolm plus myself visited him in the hospital on May last, he was his old undaunted and cheerful self. He was at the time planning to attend the reunion in Los Angeles, and spoke about seeing many of his close comrades with great anticipation. As you know Don he had a deep emotional attachment to both the 508 PIR Assoc., and its' lifeline the "Static Line." His fondness for these and his love for his family and fellow "troopers" were his lifeline throughout his adversity.